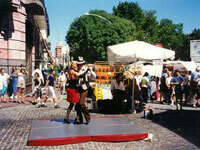 Plaza Dorrego lies in San Telmo, the bohemian artists' quarter of Buenos Aires and the birthplace of tango. The tiny square is surrounded by elegant houses, now mostly converted into antique shops and bars whose tables overflow onto the street. There are numerous museums nearby the Plaza Dorrego worth visiting, including the Museo Histórico Nacional and the Museo de Arte Moderno. On Sundays, the plaza is the setting for the ancient flea market, the Feria de San Pedro Telmo. Though you are unlikely to discover too many bargains, you may find an interesting souvenir or two. Once the stallholders pack up their wares at 5pm, the square becomes a stage for informal tango dancing. This is as popular with the locals as it is with tourists, and even the inexperienced may be tempted to try it out. Aside from the museums, flea markets and dancers, another of the square's main attractions is simply the people watching. Visitors to Buenos Aires will not regret an afternoon spent whiling away the hours at a sidewalk cafe, soaking in the atmosphere and admiring the passers-by until the dancers arrive for the evening's festivities.